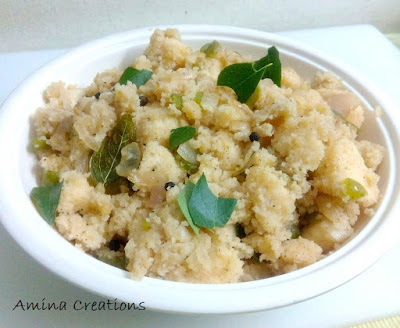 This is a quick breakfast dish made with idlis. I have shared recipes of mini sambar idli and idli manchurian in my earlier posts and today I am sharing the recipe of pepper idli. It is quite similar to idli upma but differs in its taste due to the presence of peppers - black peppercorns, pepper powder and bell peppers. You can try this recipe when you wish to take a break from your regular breakfast menu and try something new. Add onions, capsicums, curry leaves and black peppercorns and saute till the onions and capsicums turn soft. Now add pepper powder, salt, lemon juice and water and bring to a boil. Reduce heat and add the idlis. Close a lid and allow it to cook in low flame for 2 to 3 minutes. Open the lid and see if steam is coming out from top. If not, cover and cook for one more minute. You can serve this with tomato chutney and masoor dal curry.